If you’re looking for something besides another new Netflix show to binge so you can stay entertained before summer officially begins, might I recommend throwing a dinner party? That’s right, a big girl, fancy pants, multiple forks, cloth napkin dinner party. That certainly sounds like a lot of fun to me — well, in my head at least. A dinner party would be a chance to bring together my dearest friends, have fun conversations, make a fantastic playlist, and hopefully laugh until we cry. Only problem: I’m a self proclaimed “Lean Cuisine girl” who could potentially food poison my guests if I make anything other than grilled cheese or pasta with store bought sauce. I decided not to let this small hindrance deter me from creating some dinner party magic and throwing an evening my friends would not soon forget — but first, I knew I’d better consult with a professional. 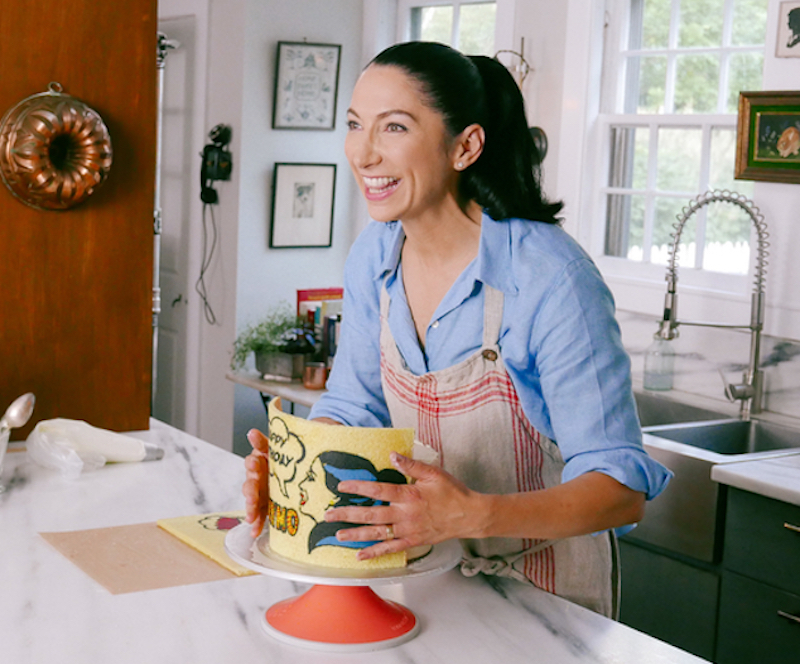 I turned to master pastry chef, author of many a cookbook, and star of the Food Network show Baked in Vermont, Gesine Prado. I figured if anyone could help me, it probably would be Gesine. Read our conversation below, and be sure to catch the Season 2 premiere of Baked in Vermont on Saturday, May 5th at 10:30 a.m. ET/PT on Food Network. HelloGiggles (HG): I know you yourself are a master chef, but what advice would you have for someone who is just starting out but still wants to wow her dinner guests? Gesine Prado (GP): Invest in at least one really good pan, one good chef’s knife, and a sous vide. That last piece of equipment is a game changer. [French for “under pressure, sous vide is a method of cooking food in sealed pouches or jars submerged in a water bath, held at precisely regulated temperature, to cook evenly and retain moisture.] That allows you to make restaurant worthy proteins with very little work. Proteins tend to be the toughest thing for beginners to get just right, and sous vide just makes it all perfect and delicious. It’s straight from a molecular gastronomist’s toolkit, but it’s deadly easy to use and available on Amazon. GET IT! It also stores easily, so it’s not this huge piece of equipment that takes up most of the real estate on your counter. And you can sync it with your phone, so you can essentially cook remotely. HG: What was your go-to dish for entertaining when you were first learning to cook? What is it now? GP: I always made Salmon en Croute. Now, I change it up all the time. My favorite is Cassoulet [a slow cooked casserole containing meat, pork skin and white beans]. It literally takes about a week to prepare, so it’s a once a year treat. Twice, max. HG:Did your parents or any parental figure bake for you growing up? GP: My mother and grandmother were both phenomenal bakers. Unfortunately, my mother was a nutrition and fitness buff — so she kept her skills under wraps until the holidays. That was it. So I had to get mad scientist in the baking department at a really young age to get my cake fix. HG: What was the first thing you ever cooked or baked? How did it turn out? GP: I made a birthday cake for my mom from the Winnie-the-Pooh cookbook. It was pretty damn good. HG: What was your most memorable dinner party? Do you remember what was served? GP: My husband and I threw an insane dinner party that ended in an epic foosball match, break dancing, and an impromptu jazz quartet wailing in our game room. It was a casual gathering, not a multi-course extravaganza, and if I remember correctly, I made my famous individual Herbed Biscuit Chicken Pot Pies and a simple blackberry crumble with homemade vanilla bean ice cream. It was all insanely down to earth, but it was delicious. Everyone was comfortable and relaxed — and then a little bit crazy. HG: Since pastry is your specialty, I MUST ask: You’re trapped on a desert island with one dessert and one dessert only. What is your dessert island (pun intended) treat? GP: Crostadas are dead simple, don’t require any specialty pans, and while it’s a “rustic” style tart, you can really make it a piece of art just by the thoughtful arrangement of fruit inside. HG: Separate of the food itself, what is one must-have for a great dinner party? GP: Great music is crucial. We have a Shinola record player and a great collection of vinyls, so guests get to play DJ. And we have a game room, so things end up getting competitive and loud quickly. It’s a great way to digest. HG: Can you give HG readers (and me) one great basic recipe for a glamorous, winning dish that would be perfect for a group dinner? HG: Do you remember ever having an epic dinner party flop? 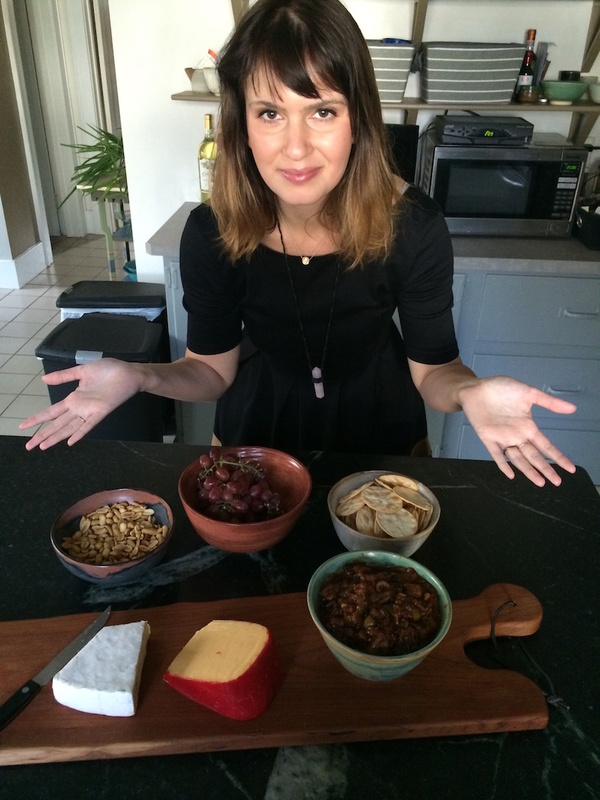 GP: My first real dinner party involved a massive pot of jambalaya that I managed to scorch. I thought I was being clever by making a one pot meal, but I burnt the bottom and it infused the entire dish with an unappetizing smoky musk. But my friends were all so lovely — they wouldn’t be friends if they hadn’t been — and we all tried it, agreed it was ghastly, and ordered pizza. We still had good wine and dessert. HG: I know you host classes in your 18th-century farmhouse, Sugar Glider Kitchen. For those of us who don’t live in Vermont and want to take these amazing classes, where else can we go to get your tips? GP: I have online classes available on Craftsy.com and you can always check out Baked in Vermont on Food Network. I think my dinner party turned out pretty well for a Lean Cuisine gal, if I do say so myself. Watch the Season 2 premiere of Baked in Vermont on Saturday, May 5th at 10:30 a.m. ET/PT on Food Network and check out Gesine’s recipe for delicious Turkey Potpie with a Biscuit Crust here. Follow Gesine on Instagram and Twitter, both @gesinebp, and visit her website, www.gbakes.com.